Miscommunication Technologies is an ongoing project of the Telekommunisten Network that employs satire and emphasizes simplicity and human interactions over technological sophistication, creating platforms that don't work as expected or work in unexpected ways. They uncover the social relations embedded in network topologies and communications platforms and it comprises works such as the R15N project, deadSwap offline file sharing system, and Thimbl, a distributed social network based on the finger protocol from the 1970s. They operate as a form of performative, interactive, social-economic fiction that presents an experimental technology, engaging its users and confronting them with the social relations embedded in communication platforms. For the R15N project Telekommunisten Network adopts a retro aesthetics in order to bring through a story about the prevalence of digital divide in most local environments, and call into question the newness or hype surrounding contemporary communication platforms. They attempt to fill in the gap between the connected and the disconnected by employing an old technology like telephones. 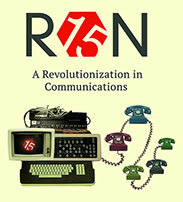 R15N is an experimental phone service which counters the pervasive social networks. R15N implements a variation on the random phone call broadcast model to enable a community to share information. The system works by arbitrarily determining who in the community will be responsible for passing on a message, setting up an ad-hoc telephone tree that allows the community to distribute messages. The exhibition is organised as part of the framework of the reSource for transmedial culture, the ongoing local and translocal networking platform of transmediale festival berlin, in the context of which the project R15N was initially launched. At the exhibition opening Dmytri Kleiner will present the Telekomunisten Manifesto section P2P Communism vs Client-Server Capitalism. The presentation is introduced by Tatiana Bazzichelli, curator of the reSource for transmedial culture. 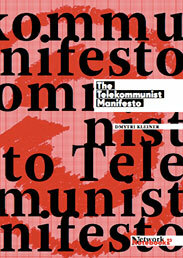 Telekommunisten is a Berlin-based collective whose work investigates the political economy of communications technology. Core themes include the incompatibility of capitalism with free networks and free culture, and the increasing centralisation and enclosure that results, as well as the potential for distributed producers employing a collective stock of productive assets to provide an alternative economic basis for a free society. Dmytri Kleiner is a software developer working on practical and symbolic artistic projects investigating the political economy of the Internet. He develops miscommunication technologies that uncover the social relations embedded in communication platforms. He is a co-founder and an active member of the Telekommunisten Network, and the author of the Telekommunist Manifesto published by the Institute of Network Cultures. At transmediale.11 he was nominated for the Open Web Award with Thimbl. His Telekommunist. The reSource for transmedial culture is an initiative of transmediale in partnership with CTM/DISK, Kunstraum Kreuzberg/Bethanien and the Post-Media Lab of the Leuphana University Lüneburg. The reSource is active in the city of Berlin throughout the year as a context of networking and projects dissemination with decisive touchdowns at each festival. The objective of the reSource is to act as a link between the cultural production of art festivals and collaborative networks in the field of art and technology, hacktivism and politics. Tatiana Bazzichelli is a researcher, networker and curator, working in the field of hacktivism and net culture. She is part of the transmediale festival team in Berlin, where she develops the reSource for transmedial culture. She received a Ph.D. in Information and Media Studies from Aarhus University (DK), conducting research on disruptive art practices in the business of social media. R15N works with any telephone and requires no phone credit. It is completely free to join and use and does not require you to have any phone credit on your phone!